‘How to be a whole school Literacy Leader’ screams the familiar course title. In those eight reassuring words is the suggestion that there is an absolute answer, a conclusive checklist, a right or a wrong way. And yet, in my years as a Literacy Leader in a large secondary school, as a SSAT Lead Practitioner for Literacy and now as a Literacy advisor, I’ve come to realise that there is no definitive definition. There are undoubtedly starting points – sensible and logical places to start as you begin to take on the ever changing and always challenging beast that is whole school Literacy. Whether you are new to the role or are embarking upon the development of what whole school Literacy is already in place, checklists, job descriptions and the ‘how to’ courses can undoubtedly support your decisions but ultimately, you need to rely upon what it is your school is telling you about its Literacy needs – yup, you need to ‘listen to your school’. So, here is a checklist –the irony is not lost on me!– proposed as a sensible starting point. Nationally – what do the government say about Literacy? Are there any new documents related to Literacy? What are Ofsted saying about Literacy? Locally – what are the local Literacy skills/needs of your families and wider community? 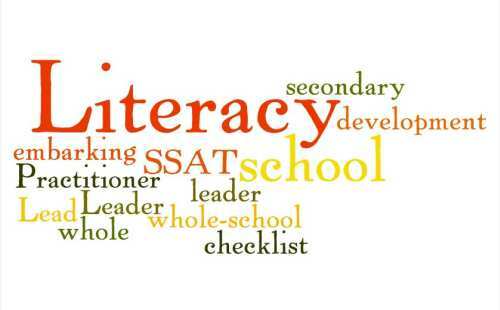 School wide – what is the current position of whole school Literacy in your school? What has gone before? What do your school plans say about Literacy and its position in the hierarchy of priorities? 2) Consider your vision for Literacy. What would an outstanding Literacy school look, feel and sound like in each classroom and in other spaces around the school? What would books look like? What would Literacy marking look like? What are the students’ books telling you? Complete a book scrutiny. Look at the quality of their written communication. Where are the strengths and weaknesses? What are the trends? What are you already doing well in relation to Literacy? Conduct a learning walk just focusing on Literacy. Look at the ways teachers support the understanding and application of Literacy concepts e.g. writing various text types, comprehension skills. Look at the environment. Is it Literacy rich? Bring together all of your information for points 1-3. Are there Literacy concepts that keep appearing e.g. extended writing, spelling? Do you feel now that there is one key area that might need greater focus than another? You need to be realistic about what you can achieve in the time and with the resources you have. Use your school development/action plan to provide a framework for creating your Literacy plan for the year. At this point just populate it with your objectives. Re-draft. And keep re-drafting. You might want to consider using a ‘milestone plan’ to support you in employing your time wisely. Having gathered a information on the those teachers with a strength in supporting whole school Literacy, you will have inadvertently pinpointed teachers who can support you with the implementation of your plan. Call them ambassadors, champions or supporters, they will be your support network. Go back to your Literacy plan and begin to add details about how you will monitor Literacy. Use your army to support you with this. It is tempting to try to solve all of the issues and introduce lots of projects but that almost always leads to you spreading yourself to thinly. Think ‘trial’. If you have an idea for an initiative e.g. Boys into Books then it may be worth trialling it with a small groups of students and your new Literacy army. Let them support the setting up and monitoring of the initiative. In time, their feedback to other staff – hopefully positive – will support you in introducing the initiative to more students. These can be incredibly effective in re/invigorating Literacy. They can help immediately in raising the profile of Literacy, influencing the Literacy culture and making Literacy visible in your school. Such ideas as ‘DEAR time’ where students have a designated 20 minute reading time everyday timetabled across the curriculum subjects can really help re-focus the whole school on reading for pleasure and creating a reading culture. Whilst this checklist is not definitive, I hope it goes some way in providing you with some key considerations when taking on the ‘Literacy beast’. Good luck! ← When is a tracker not a tracker?